When a man is busy he has two choices when it comes to his health. And from where we stand, waiting around for things to change is never an option – because that is just not how you get things done. The good news is that those hour-long full body workouts may make you feel like a beast, but real results come from consistent commitment, even if that means just 20 minutes a day on your most essential body part – the core. Allow us to demonstrate how it can (and should) be done. Start your workout with a warmup which should include 30 seconds to 2 minutes of a standard plank. This means supporting your body weight using only your forearms and the balls of your feet while maintaining a perfectly straight line that should be drawn from your heels to the top of your head. 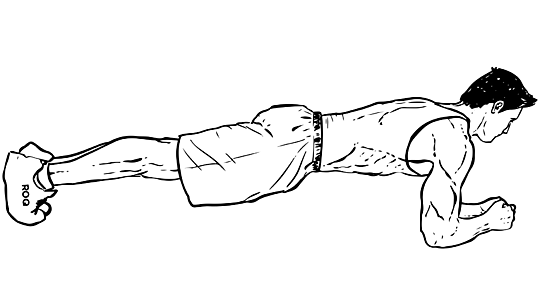 Once your core is warm, switch over to the swimming plank, which utilizes the same beginning position of balancing yourself on your forearms and the balls of your feet. Place a block or dumbbell about 6 inches from your collarbone. Keeping yourself steady, lift one arm off the ground, and using a swimming/sweeping motion, bring that arm over your head and then glide it over the top of the dumbbell/block and then as far back towards your hips as you can. Return that forearm to the ground and lift the opposite arm and repeat the motion. 15 to 30 reps on each side will prove much more difficult than they may at first sound. Take a 30-second rest whenever you need it, but continue to do these until you’ve reached that 5-minute mark. A man’s core is the base of his tripod, the foundation of his triangle, and essential muscle that does everything from making you look fantastic next to a pool – to keeping your lower back pain and injury free. 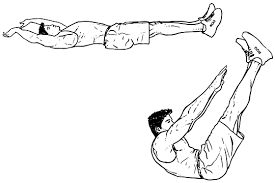 The abdominal Crunch is fantastic at building your core, provided that you do the movement strict and in perfect form. Lie flat on your back, bend your knees, plant your feet firmly on the ground about hip distance apart, and raise your head and shoulders off the floor without pushing on your neck with your forearms (crossing hands in front is optional). Hold that position for a clean 6-seconds (about 3 deep breaths) and then return to the starting position. If you do these correctly – 30 reps will end up feeling a lot more like 200 by the time you’re finished. Something as essential as the core isn’t a body part that you can hit once and call it a day. You’ve got to nail it from several angles and leave it long (stretched) and strong (pummeled). The foot to foot crunch hits the overall abs, with a strong focus on the obliques (where those love handles tend to hide). 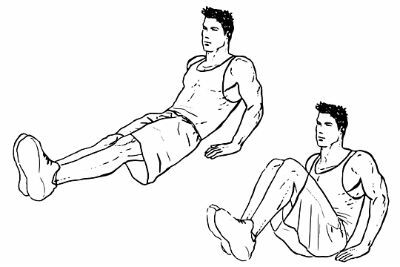 Start on the floor with your knees bent, much like the beginning to the abdominal crunch. Place your hands by your side, palms facing towards your body, and lift your shoulders off the ground and – doing only one side at a time – reach each hand towards the heel of the foot in front. Hold this movement for a couple breaths before switching over to the other side. 15 to 20 reps (per side) should leave you burning. This is a challenging move, and one to avoid if you have severe back pain. However, if you’re made up of a mostly sound body, this move will sculpt a beautiful 6-pack that stretches from your lower ribs all the way down to your navel. Sit on the ground using your hands to balance yourself with your heels lightly touching the ground. Gently pull your feet off the ground and slide them horizontally towards your chest until your knees are within inches of touching your chin. Hold for a couple breaths and then return your feet to the beginning position. For a bigger challenge, this move can be easily upgraded to a Frozen V-Sit. 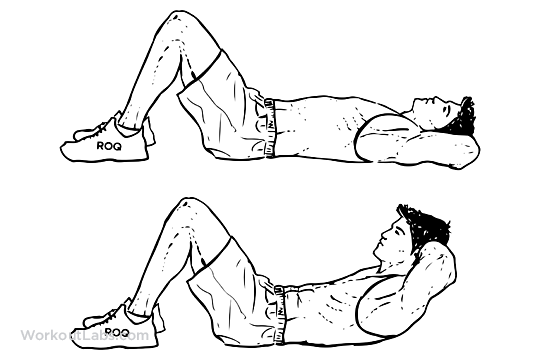 Start the movement laying flat on the ground with your arms stretched overhead. Avoid bending the knees or using your forearms for support. Complete this movement by lifting your legs off the ground along with your body until you resemble a v-shape. Hold this position for a couple breaths before returning to the start.